Safety, Income & Growth Inc. (NYSE: SAFE) is the first publicly traded company focused on ground leases. We seek to become the industry leader in ground leases by bringing an innovative and institutional approach to the market. We see an opportunity to capitalize on a misunderstood sector, significantly expanding the use of ground leases in commercial real estate. Our manager and largest shareholder, iStar Inc. (NYSE: STAR), brings more than $35 billion of real estate transactional expertise over the past three decades. With 8 offices throughout the US, iStar and its resources are aligned and motivated for Safety, Income and Growth’s success. 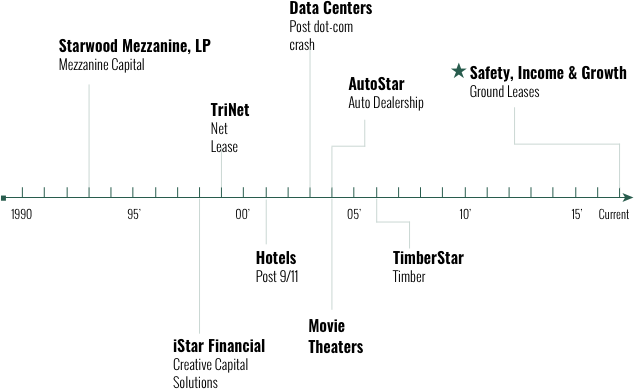 iStar was a pioneer of the market for mezzanine real estate debt in the early 1990s. In the early 2000s, iStar identified and capitalized on the mispricing of net leases, which have become one of the largest REIT subtypes. We believe ground leases represent the next big opportunity in commercial real estate finance.